S10E11 - "World Enough and Time"
Oh can you even begin to imagine how that ending would've felt if we didn't all already know it was coming? 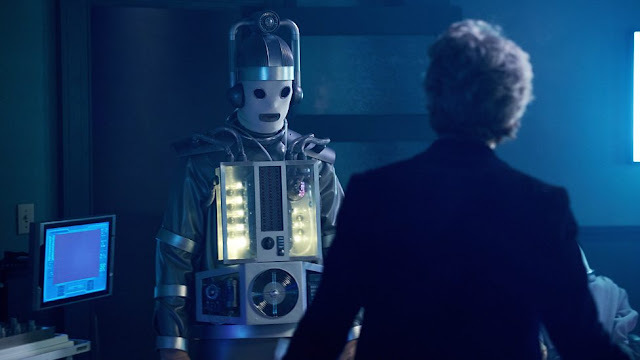 "World Enough and Time" is expertly paced in how it builds to two enormous reveals - the Mondasian Cybermen are making a comeback, and John Simm's Master has returned. Unfortunately, these two reveals were announced by the BBC way back before the season even began. It was a move to try and win viewers back to Doctor Who, to try and get the much needed casual viewer interested again with the return of an old face from the much-adored Tennant years, but that doesn't prevent it from being an incredibly frustrating decision by the BBC. Let's get this straight first, knowing that these reveals were coming in no way lessened "World Enough and Time". This is a brilliant hour of television from Steven Moffat, beautifully directed by Rachel Talalay. It's an episode as smart as it is intricate, as bold as it is thoughtful. Every cast member is on top form throughout, arguably stronger than any of them have been all season. I just can't help but think - how unspeakably exciting would the final five minutes of this episode have been if we didn't know they were coming? Alas, that's something we can't change, and so "World Enough and Time" must be judged as is. The genius of Moffat's script here is subtle, impressively so. The man's writing can often feel very loud, very "in your face" about how great it is, whether or not he's earned the right to do so. But this penultimate episode holds back from that, taking a brilliant concept and using it in unexpected ways. The Doctor, Bill, Nardole and Missy are on a 400-mile long spaceship that is reversing away from the gravitational pull of a black hole - AKA, on one end of the ship time is moving much faster. Rather than use this concept to form an episode of conventional wibbly-wobbly-timey-wimey nature, Moffat instead uses it to craft something more emotional. By pulling Bill away from the rest of the cast and putting her on the other end of the ship, a race against time begins - but it's one the Doctor has already lost. Within mere minutes passing for the Doctor, Bill has already been fitted with a robotic heart and is forming a new life down on the bottom floor. The Doctor has left an imprint in her mind though - "Wait for me", he tells her, and so she does. Only then, about fifteen minutes in, does the episode slow down and take some time to start thinking. It's unquestionably the strongest first act of any episode this series, but what's refreshing is that the slower parts of the episode are still just as strong. We follow Bill through a hospital ward in what can only be described as the most unnerving Doctor Who sequence in a decade - a room filled with masked patients, the only conscious one repeating the word "pain" over and over again. After nearly being discovered by a creepy man she soon befriends, Bill learns a horrible truth - the other patients aren't sleeping peacefully, they're just on mute. It's downright horrifying, and it adds a whole new layer to "World Enough and Time". Moffat's episode tackles a lot here, but his script is seamless in how it juggles everything. We cut back and forward in time repeatedly, but the transitions are slick and there's a clear path from point A to point B. Complex and confusing are two things that frequently, unintentionally, come hand in hand - "World Enough and Time" is a deeply complex script, but not once does it leave you in confusion. This is elevated even further by the reliably brilliant work from Talalay, the go-to director for Peter Capaldi era finales. Her magnum opus for Doctor Who - or maybe even her whole career - will always be her work on "Heaven Sent", but Talalay carries a multitude of visual tones through this episode and balances them all with precision. We range from the horror fuelled sequences in the hospital ward to that playful first act in the ship's cockpit, and Talalay captures each mood perfectly. As terrific as it is, though, most of the episode would feel redundant if it weren't for that ending - and, boy, what an ending. There's an awful lot going on in the final few moments here, but the episode cuts between scenes smoothly, allowing the tension to build on both sides simultaneously. Bill's creepy friend reveals himself to be the Master in disguise all while Bill herself is turned into a Cyberman. If this really is the end for Bill Potts, it's a damn harsh way for her to go. As the Doctor finally learns the truth, the former Bill Potts only has two words for him - "I waited". "World Enough and Time" is an unforgettable episode of Doctor Who. Not only does it give us two massive plot twists in its final act, but everything beforehand is so elegantly structured and beautifully executed that it would be a contender for the series' highlight even before these reveals take place. This is Doctor Who as smart, emotionally charged sci-fi, the kind of show it always should be. It's never going to operate at this scale on a permanent basis, but every other episode this series - bar perhaps "Extremis" - should take a long hard look at what Doctor Who is capable of when everything comes together like it did here. Chris Chibnall, take note. If this episode didn't feel important enough, Peter Capaldi's regeneration seemingly begins in a flashforward before the titles have even rolled. I'm not sure how I feel about all that meta humour in the first act. Michelle Gomez delivers it all wonderfully, but is all the "Doctor Who" stuff a bit too on the nose? Or is it so on the nose that it crosses back over into brilliance? I don't think I'll ever decide. "Exposition and...comic relief" was hilarious though. I didn't really mention how great Capaldi and Mackie and Lucas were here, mostly because there's little left I can say about them that hasn't already been said. They're terrific. I'm reserving judgement until next week on how John Simm will play the Master this time around. I loved him in "The Sound of Drums", wasn't fully convinced by "Last of the Timelords" and outright hated him in "The End of Time". This should be very interesting. How beautifully rendered was that black hole? A solid contender for Doctor Who's greatest ever VFX moment, for sure. Next week comes the season finale. Steven Moffat has a pretty uneven track record when it comes to finales ("The Big Bang" and "Hell Bent" are exceptional, the rest are...not), but here's hoping he lets Capaldi go out with the bang he really, truly deserves. I guessed that creepy man was John Simm about twenty minutes into the episode. Just sayin'.